Eric Young looks unstoppable. 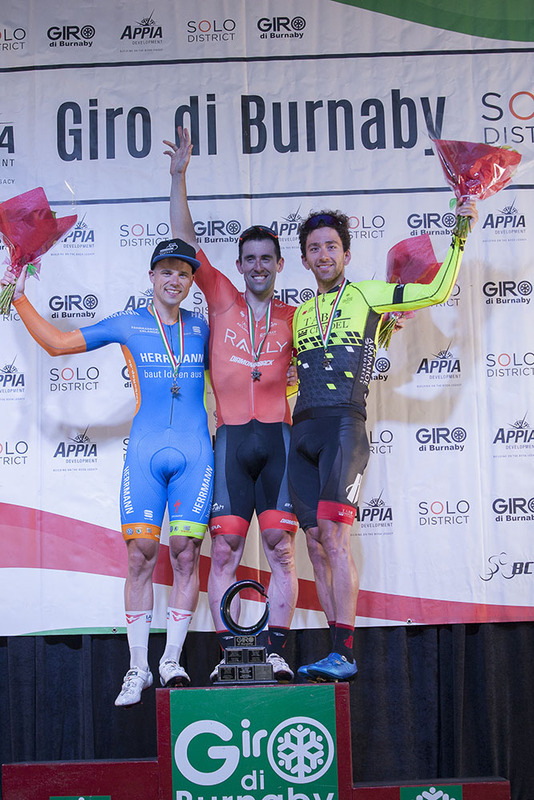 The Rally Cycling sprinter from Boulder, Colorado continued his torrid pace at BC Superweek with a win at the Giro di Burnaby presented by Appia Developments before a huge crowd in North Burnaby on Thursday night. 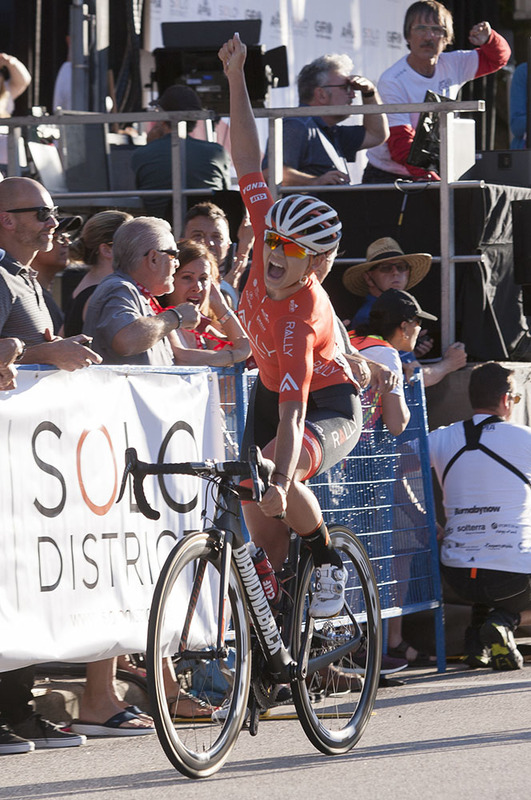 Young has now been on every podium at BC Superweek thus far, including wins in North Delta and Ladner as part of the Tour de Delta and at the Global Relay Gastown Grand Prix. He was also third in Sunday's White Spot | Delta Road Race and second in Tuesday's New West Grand Prix. About eight laps into the Giro di Burnaby, the 29-year-old Young was almost forced out of the race after a mishap in the peloton just before the hairpin turn at the east end of the course on Hastings Street. "There was just a bit of a tangle in the hairpin there, my derailer hanger was pretty bent so I just basically bent it back in the pits. I wasn't too confident in the high power shifting when sprinting, but I saw the crowd prime late in the race and I was in good position for that,” said Young, who was in the top 10 for much of the race after re-entering. Once Young heard the bell and attacked on the crowd prime lap, he developed a close to 100-metre gap from the chase. "I just thought I'd gamble on that crowd prime and make some good money. I got that and then didn't quite realize it was one to go, so when it's the last lap, you've just got to giver. I did that and was just able to stay away." Young, who was 2011 and 2013 US National Criterium champion, took advantage of a field that started to falter in that final lap. "It was right at the end of the race, so obviously everyone's legs were a bit different than at the start. But then everyone is also trying to conserve energy and focus on the sprint, so it's a different situation than early in the race when you're just able to shut anything down. It doesn't work often but sometimes when it does, it's pretty cool!" Second place finisher Florenz Knauer, riding for Hermann Radteam, came second to Young for the third time at BC Superweek this year, and made it onto the podium for the fifth time in six races. He painted a massive target on Young when he animated the race. "I saw Eric going and in the hairpin turn, I was on the opposite side, so I couldn't follow him,” the 29-year-old explained. "I thought, 'Dammit, I have to be on his wheel!' but we couldn't catch him. My teammate Christopher Hatz rode like a six-man team - better than other big teams - so I have to say thank you to him." In third was Australian cyclist Joseph Lewis. The 29-year-old is a BC Superweek riding for the Holowesko | Citadel Cycling Team. He sprinted in just behind Knauer. 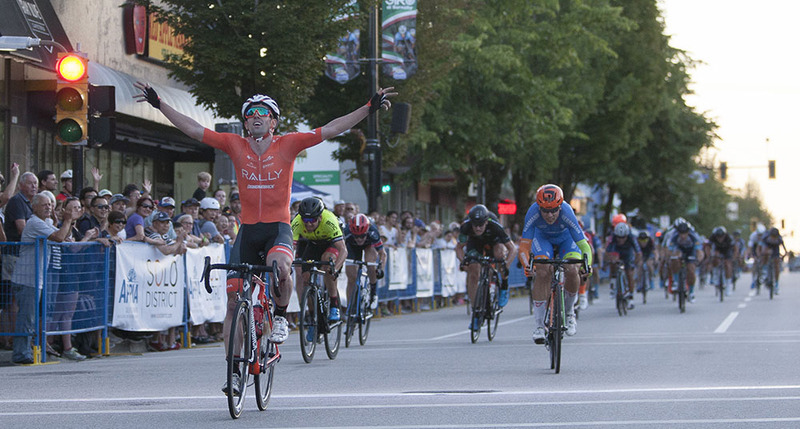 Young and his Rally Cycling teammates are painting the podium orange at BC Superweek this year, but post-race at the Giro di Burnaby, he took the opportunity to genuinely express how he feels about racing in the communities hosting this ten days of racing. "You guys are amazing, us racers are so happy to be here, you put on a great event in a great city, and we'll be back next year, but we're having a great time this year!" 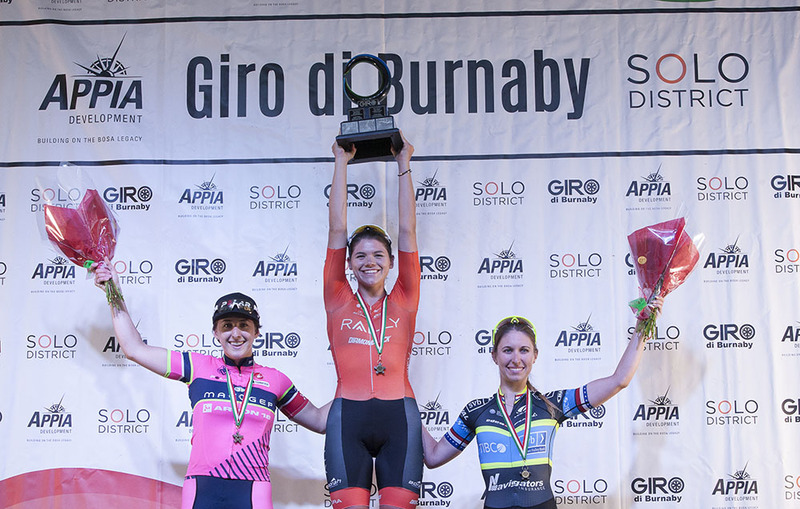 Rally Cycling continued its dominance at BC Superweek on Thursday night at the Giro di Burnaby presented by Appia Developments as Summer Moak sprinted to win the 11th edition of the race in Burnaby's historic Heights neighbourhood. The rider from Scottsdale, Arizona gave the Rally women's team their fifth podium overall in the series and second win after Sara Bergen won the New West Grand Prix on Tuesday. As for Thursday's 40-lap, 45 kilometre race, the plan for Rally was to stay in the hunt and keep Moak in for the sprint to the finish. "My team believed in me and all I had to do was finish it off today. They set the reset perfectly for me and believed in me, so that's all it takes,” said the 19-year-old who started riding bikes for fun eight years ago. Despite one of the biggest crowd primes at BC Superweek, Moak added that it wasn't something on her team's mind at that point of the race "It was all about the win!" she smiled. Moak and her team were very aggressive on the last lap, knowing that it would come down to a sprint. "We were pretty far back, and we knew we had to move up. We had one plan and we were going to move up on the back straight. I followed Sara and believed in my lead out. That was all it took and all I had to do is come down this last straight as fast as I could." Local rider Maggie Coles-Lyster of TaG Cycling came second, just a wheel behind Moak. It's her first time on the podium in Burnaby after finishing fifth a year ago. Coles-Lyster first rode the Giro di Burnaby as a 14-year-old and the race along with BC Superweek has been huge for her development as a cyclist. "It's been so key for my progression, and for other young riders as well. There aren't many opportunities to be a young racer and do world class races with other pro women, so I can't say enough how key it is and how much I would recommend it to other young riders!” added the 19-year-old from Maple Ridge, BC. In third was Kendall Ryan of Team TIBCO – Silicon Valley Bank for her fifth podium appearance in six races at BC Superweek this year, after she won all three races at the Tour de Delta along with the Global Relay Gastown Grand Prix. The 25-year-old has collected more $17,000 in prize money alone. BC Superweek continues Friday with the PoCo Grand Prix presented by Dominion Lending Centres. The pro women race at 7:50 pm while the pro men take the start line at 9:15 pm. For more information, visit www.pocograndprix.ca. 17 Laurie Jussaume (Can) Cyclery Racing all s.t. 20 Marie-Soleil Blais (Can) Desjardins-Ford p/b Cromwell both s.t. 26 Ann-Pascale Ouellet (Can) Desjardins-Ford p/b Cromwell all s.t. 32 Dafne Theroux Izquierdo (Can) Desjardins-Ford p/b Cromwell all s.t. 40 Abigail Mickey (USA) Rally Cycling all s.t. 43 Jasmine Soh (USA) V.C. Cascade both s.t. 40 Lukas Conly (Can) Applewood Garneau p/b Smart Savvy all s.t. 45 Mitchell Thomas (USA) The Lead Out Project all s.t. 47 Francis Izquierdo-Bernier (Can) Probaclac/Devinci s.t. 55 Maurice Worsfold (Can) Hewdog Racing all s.t. 58 Jackson Duncan (USA) Independent s.t. 60 Derek Gee (Can) Team RaceClean s.t. 62 Normand Richard (Can) Independent s.t. 66 Drew Levitt (USA) Groove Subaru Excel Sports all s.t. 74 Marc Antoine Soucy (Can) Silber Pro Cycling all s.t. 83 Olivier Peloquin (Can) Probaclac/Devinci all s.t. 86 Jackson Kinniburgh (Can) Bicisport s.t. 90 Nicolas Masbourian (Can) Silber Pro Cycling s.t. 95 Steve Fisher (USA) Jelly Belly p/b Maxxis s.t.